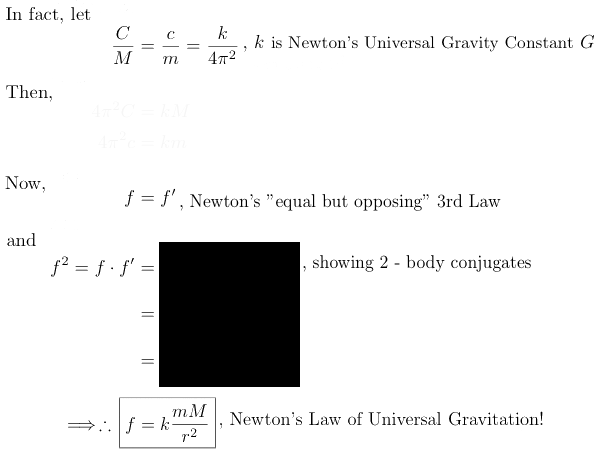 Proposition: The Kepler Laws allowed Newton to establish his Law of Universal Gravitation without which Newton would have been at a considerable loss! 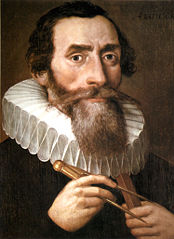 Prior to Johannes Kepler ( 1571 - 1630 ), Copernicus ( Polish: Mikolaj Kopernik, 1473 - 1543 ) supposed that planetary orbits were approximate circles which indeed are ellipses of a special kind. 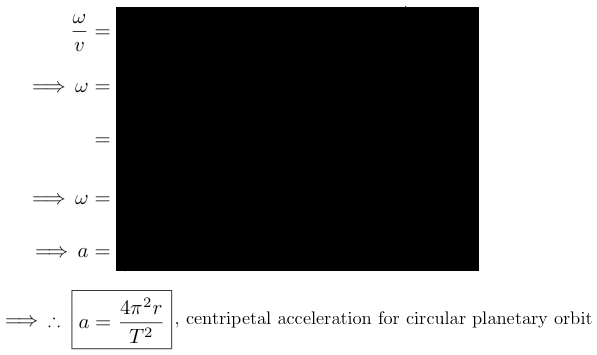 In any event, because circles are special cases of generalized ellipses, any derivations based upon Kepler's 1st Law ( Planetary Law of Ellipses ) for ellipses must also hold true for circles. 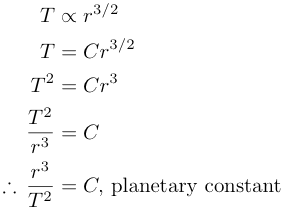 This then provides one of the first and most important empirical proofs of Newton's Law of Universal Gravitation since planetary centripetal acceleration solely depends upon the distance of the planet from the sun!! 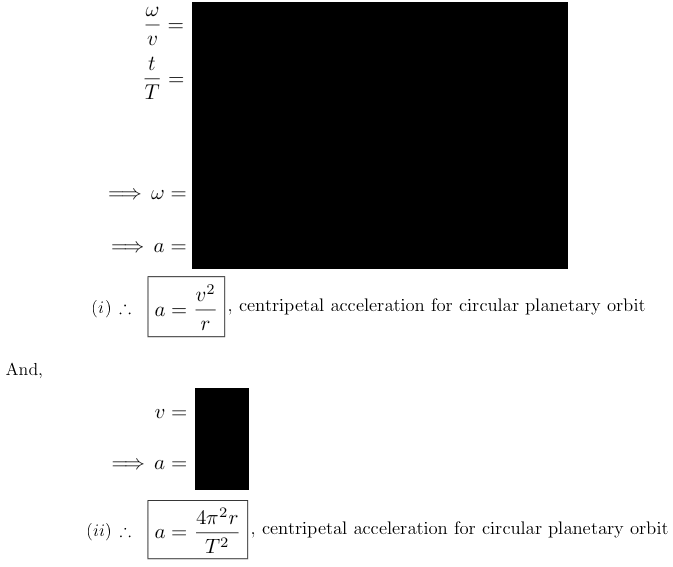 Of course, planets do not accelerate and fall into their center bodies due to a countervailing centrifugal force and Newton's Law of Inertia. 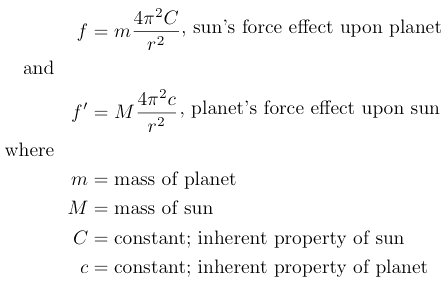 Hence, here is a further interpretation of the force which maintains a planet's orbit about the sun and which is directly dependent upon the planet's distance from this central body. 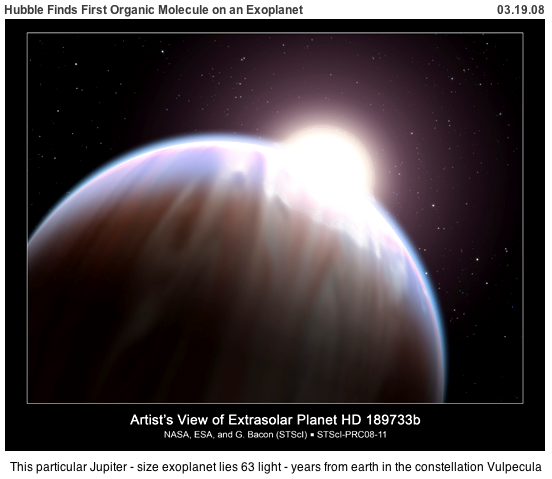 This says that there is some universal value, , for both the sun and any planet and therefore for any body whatsoever in the solar system. 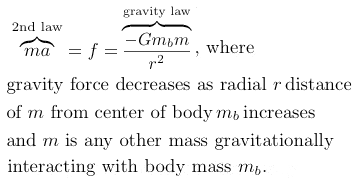 This universal factor of proportionality, , is called the gravitational constant and was finally and fairly accurately implicitly determined [ within 1% ] in 1797 by British Henry Cavendish ( 1731 - 1810 ) whose original intent was to calculate earth's density relative to water. 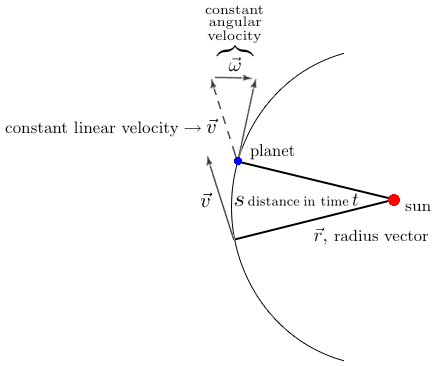 Rather, Cavendish misinterpreted his discovery of the gravitational constant as earth's density; nevertheless, the torsion balance apparatus conceived and built earlier by then deceased John Mitchell ( Reverend, geologist and English natural philosopher, 1724 - 1793 ) was crated and sent on to Cavendish which allowed him to complete his 1797 experiment to within 1% accuracy of the modern gravitational constant calculation! 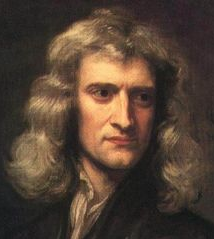 Cavendish published his results in Philosophical Transactions of the Royal Society of London, Vol. 88 (1798), pgs. 469-526. 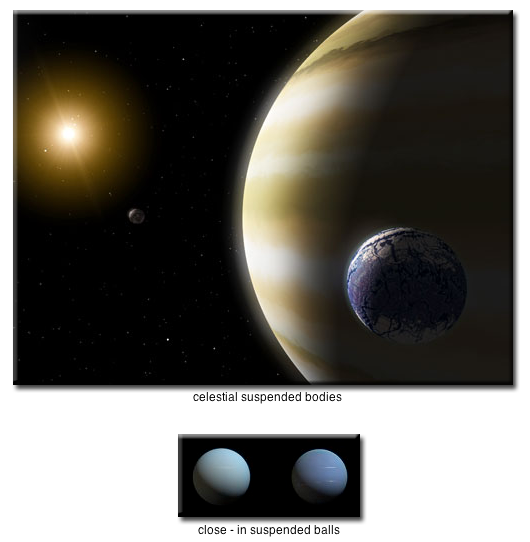 § Example 3).∗ An American astronaut lands on a distant exoplanet whose surface gravity force in terms of acceleration is 3.5 m/sec2 and whose radial distance to its center is 2,300 km. 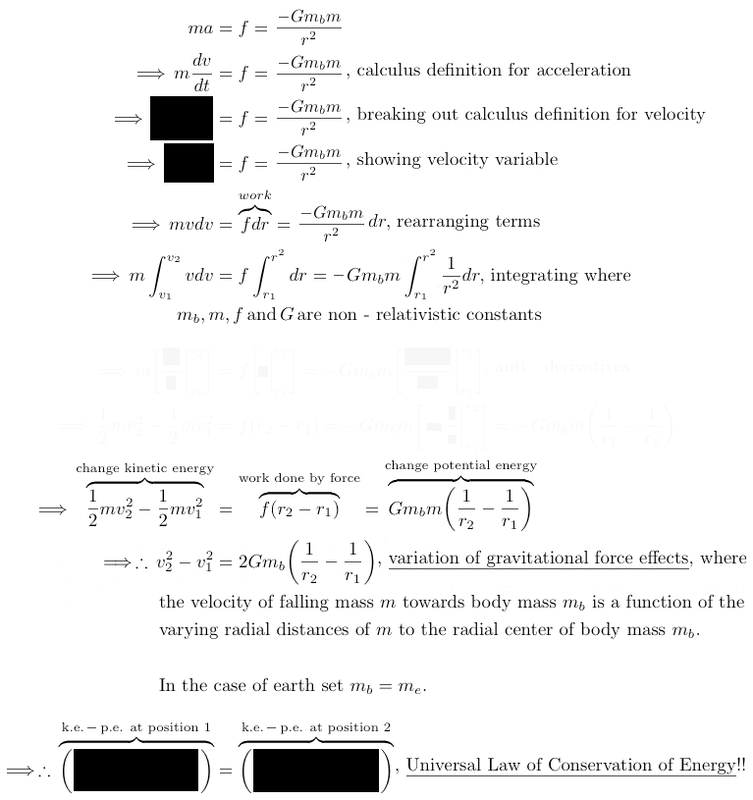 that we have here a mathematical demonstration of Galileo Galilei's Law of Falling Bodies since the final velocities and hence time of any falling body to a certain distance in a vacuum depends solely upon the gravitational force of the attracting body and has absolutely nothing to do with the mass of the falling body itself!! § Read: "The Evolution of Scientific Thought - From Newton to Einstein", by A. d'Abro, 1st edition © 1927; 2nd edition © 1950. Wonderful exposition of the history of scientific thought from the pre-relativity physics of Galileo and Sir Isaac Newton to a brief discussion of the expanding universe since the big bang of Belgian Abbé Lemaitre as a consequence of Albert Einstein's newer theory of General Relativity introduced in 1916.